-Resetting Adv ID -Not allowed as is forbidden by the Terms and Conditions of Video providers. -Use of Emulators -Forbidden for the same reason as above. Upselling - sell a single player throught different teams to have a benefit of the resources ¿? Using 2 accounts in a same League- for the benefit of one - ¿? Any question related with rules please, feel free to ask. Today we will talk about Video offers for boosters. NOTE: I will also explain what to do in the case that you don't get your Token reward after completing some of the regular offers, at the end of the post. First off - Video adverts are distributed by the service of Offer Providers. These Providers show offers based on various demographics, such as region, account history, reward amount, time of year and others according to their interests. The videos' purpose is to "advertise" to specific demographics, after all. Thus availability of said video offers may vary each day. And by availability I mean the amount of videos you may get on a daily basis. Now then, with that said - Not too long ago (In the merry month of May - 2016) we introduced something like a "soft-cap" to the overall amount of videos anyone can be provided by the offer providers each day. This has been done after we analyzed a lot of data in regards to what is the availability of Videos on a global scale. Turns out that, and many have noticed this, there were some Managers out there who were receiving dozens upon dozens of boosters simply because of demographics. And since telling the advertisers to simply "pump" more videos to people's accounts isn't an option, we decided to simply put a soft-cap that at least can minimize the disparity in availability. What we did was basically compromising between profit and player-experience. We want the players to have the option to manage their Clubs properly even if they lack the financial status of other folk in the world. "Yeah, yeah... rainbows and sunshine - Just tell me what's the soft-cap then, Jeeves?" - It's lower than before. "Why so vague, Jeeves?" - Simple, we don't want people to abuse these soft restrictions, and believe me, giving out specific numbers provides such people the option to cheat and go around the rules. With all of that explained, let's jump in to the recent issues that we've been having with videos. NOTE: Depending on when you read this post this information may vary in how accurate it is. 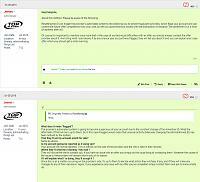 Check the "Bugs and Technical issues" forum for up-to-date info on any such subject. The issues with videos have been among the following - Crashing of the Video stream; Crashing of the Top 11 app; Video not playing to the end; Black screen; Booster not rewarded (Many times they are just delayed a bit); And some others. To deal with these issues we have actively been gathering information and specific names of Videos Adverts from all the Players who took the time to take screenshots, report in detail what was happening, when was it happening and basically sometimes going out of their way to help out! Thank you so much to everyone. Having this information we've been working hard with the Offer providers in order to fix these issues. Thus, if you EVER experience a technical issue when trying to watch a video, make sure to write to our support team about it and provide as much assistance as you possibly can. It actually helps! 1. Go back to the Offer Wall of the Offer provider - The same place from which you took the offer. 3. Once you find it, click/tap the button and just follow the on-screen instruction. 4. If you are unable to open a ticket with the offer provider due to what-ever reason, just write to our support team and they will assist you! NOTE: Administrators, Moderators and last but not least, Managers - Please redirect all "Video availability" conversations to this thread. Let's keep the place tidy and not open up new threads on the same matter on a weekly basis. * Make shore you have no 3rd party app that blocks any ads from these advertising companies. * Make shore you have stable connection to device used. DONT reset advertising ID too often as this can effect getting ads at all. "Now, before 7.10.2, an option in Developer options ( Android ) WAS switched ON by default. What happens today in many hours of digging into the phone's settings, I've noticed it's switched OFF - KEEP ACTIVITY WHEN LEAVING APPLICATION. I appeal to every1 having same problem as me - make sure to re-switch this option - ON again. What happens is : While we watch a video for packs, we LEAVE the app ( Top Eleven ) in order to be checked by the ad's server. When this nasty option is OFF, we leave the app, and the activity is this very moment is cleared, gone, nada, so the provider can't determine where we came from, what for, and why, causing Deny on the receiving packets ( network packets ). I've tracked down that these packets are immidiately blocked by the receiver ( provider ), which makes him "think", the sender ( we ), are faking network packets. I don't know if this is the case in iOS, but that was the problem in my specific case. Again, android users should check and re- chek Developer options ( Keep activity after leaving applications ) if it is switched ON, after the update"
Last edited by khris; 02-23-2019 at 05:59 PM. casper™ and Morph55 like this. Can someone from nordeus tell us what can we do if there is no available video for the X2 training ? I mean when the button does not exist while we have vids for the other packs. khris and siko232 like this. -Point 1- All depend of the offers availability, so if one don't reset the ID Advertising, offers will appear if are available. Last edited by khris; 03-02-2018 at 08:21 PM. Me i don't understand, somebody please explain? This: "About this method. Please be aware of the following. Resetting the ID can trigger the provider's automated systems into believing you to exhibit fraudulent activities, which flags your account and can undermine future offer completions from your side, as well as cause technical issues with the distribution of rewards (The advertiser ID is a form of address after all). Of course it's important to mention once more that in the case of any technical difficulties with an offer you should always contact the offer provider about it. And citing what I said above, if by any chance your account was flagged, they will tell you about it and you can explain your case after which you should get a small warning." "What does it mean "flagged"? The provider's automated system is going to become suspicious of your account due to the constant change of the Advertiser ID. What the aftermath of that will be is up to them. So in this case Flagged would mean that unusual activity (Manually changing the aformentioned ID) has been noticed by the system. That they 'll set my account a limit for vids? Is my account gonna be reported as if using vpn? Your account will not be reported. This is entirely on the side of the providers and the info is held in their records. Where they 'll send me a warning ? My mail ? They will not be the one to contact you. If you have an issue with an offer you simply do the usual thing of contacting them. Whatever the cause of the issue is, the providers will always inform you of it's nature. If I will explain what I 'm doing, they 'll accept it ? Since this is all a matter occurring on the providers' side, it's up to them to decide what action they will take, if any, and if they will make any changes to any of their decisions. Again, if you experience any issue with an offer you've completed simply contact them and ask to know what's up." Your doubts are related with this thread. If you read carefully, you'll understand the meaning of this current thread. A disaster these last few days... watched some videos and nothing happened.. no boost added! Never once had the ad actually open , not once in 19 seasons. Why are there no reward videos available any more. Mine just stopped completely...I just get "No reward videos available at this time. Check again later!"